I have been waiting MONTHS for this day. Today, my friend Jessica from How Sweet Eats has her second cookbook release! And I’m not kidding you when I say that this book is a MUST HAVE. Jessica has been an incredible inspiration to me over the years; her food blog was one of the first I completely fell in love with. She has a fun way with words, and an incredible ability to make you feel as though you are right there, cooking alongside one of your good friends. Not to mention that her food is always mouthwateringly gorgeous and oh-so-creative! SO, it should be no surprise that her book, The Pretty Dish, is also completely GOR-GE-OUS. Like, insanely beautiful. I want to make every single thing out of this cookbook! If you follow along on Instagram, you may have seen on my stories that Jess sent me a copy of the book a couple weeks ago, and I basically fangirled out in the most embarrassing way possible. No regrets! I stand by every second of my dramatic “OMG” reaction. As soon as I received the book, I knew that I just HAD to share a recipe from it with you guys. 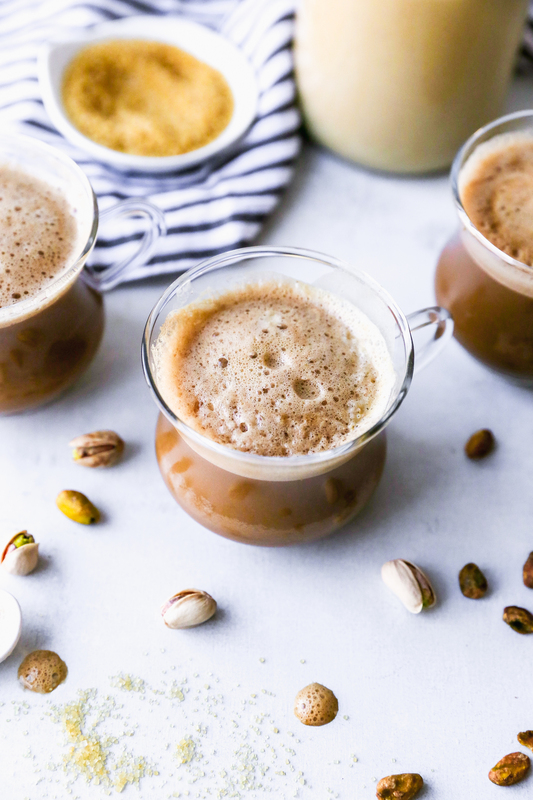 And as stunning as every single thing in the book is, one recipe jumped out at me IMMEDIATELY: Pistachio Lattes! I mean, how GOOD does that sound? I am a huge pistachio lover, and the idea of putting pistachio in my coffee always makes me happy. I used to love getting Dunkin Donuts pistachio coffee (do they even have it anymore?? ), but it always had that overly sweet, artificial flavor thing going on. THESE, however, are all natural! Even down to the pistachio milk! Yup. You read that right. PISTACHIO MILK. Jessica’s ability to come up with the most delicious twists on recipes is amazing. 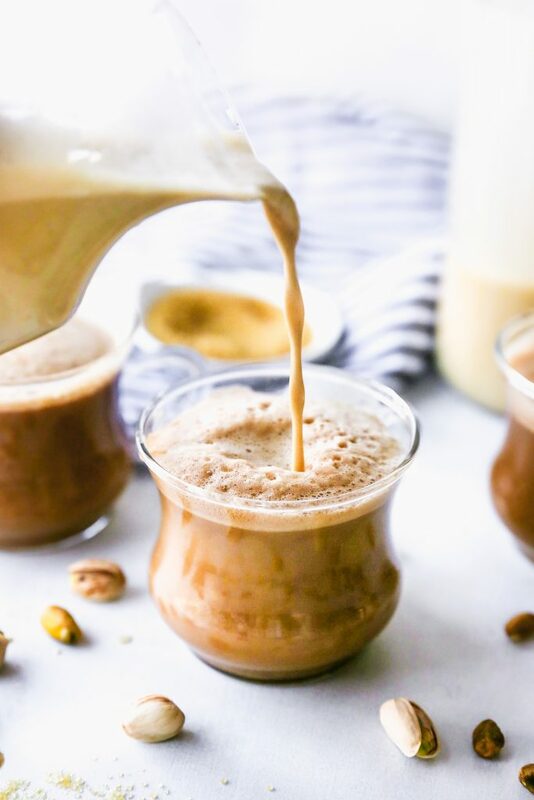 This pistachio milk is easy (no nut milk bag required! 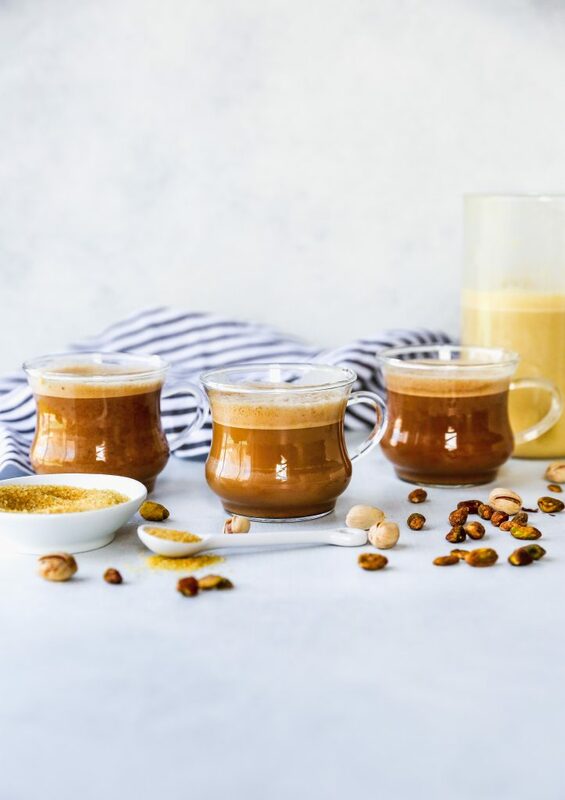 ), creamy, and has the most incredible nutty flavor. 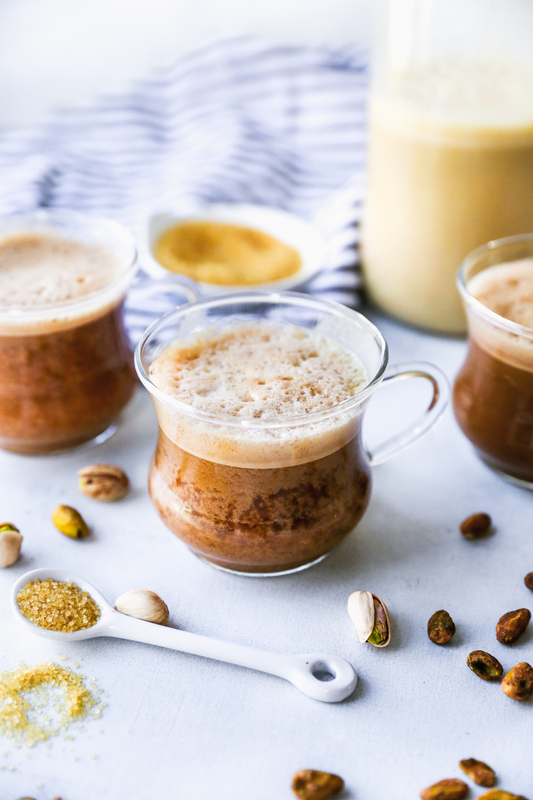 The recipe actually makes a large batch, which I was thrilled about because it meant that I had pistachio milk for my coffee and smoothies for the rest of the week! Say hello to my new favorite thing. And do yourself a favor and buy Jessica’s book. It is MAKING my life right now. Place the pistachios in a bowl and cover them with water. Soak overnight or for at least 6 hours. Drain thoroughly. 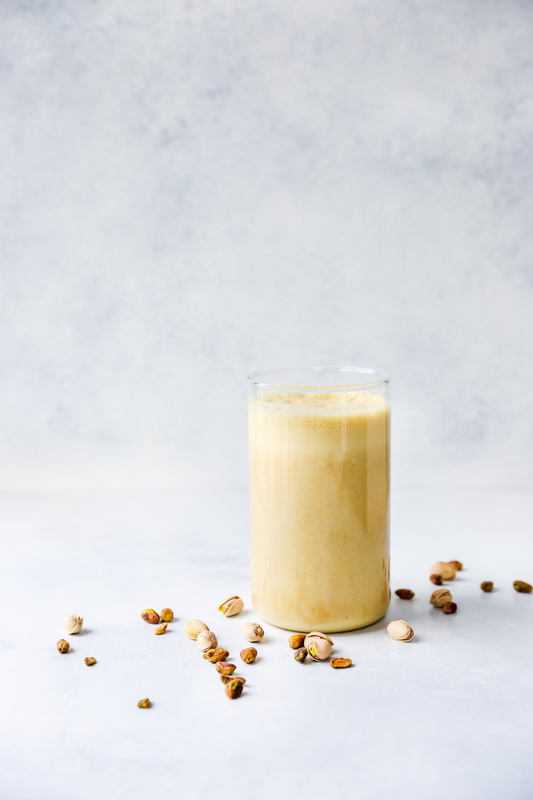 Place the drained pistachios in a blender and add the filtered water, almond extract, and 1 tablespoon of honey. Blend until completely smooth and creamy. Taste and add more honey, if desired. In a saucepan over medium-low heat, combine the sugar, water, and pistachios. Whisk until the sugar dissolves, bringing the mixture to a simmer. Cook for 2 minutes. Turn off the heat and allow the mixture to cool to room temperature. Strain the mixture to remove the pistachios and then whisk in the extract. 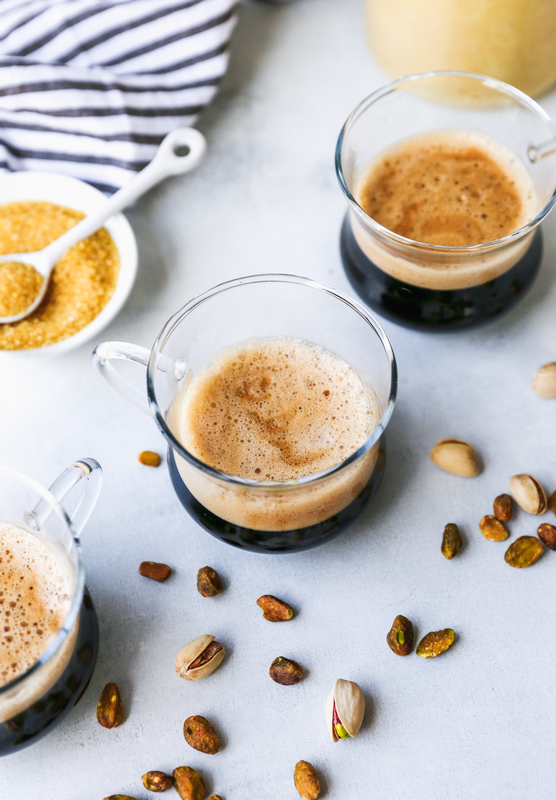 Combine the espresso and pistachio syrup in a mug and stir to combine. Pour over the steamed milk. Garnish with chopped pistachios. Serve immediately! You list almond extract in the syrup ingredients but don’t mention adding it in the instructions. Oh! I meant to address that in the post. Jessica’s original recipe calls for the extract to be added to the syrup, but I actually didn’t have almond extract and subbed in vanilla instead. I’ll remedy the recipe now! Sorry about that!